LONDON — Unlike yesterday’s first round of the women’s 1500 at the 2017 IAAF World Championships where there were no major casualties, today’s semifinals were full of intrigue as four of the nine fastest entrants on the field of the year failed to make the final and the world record holder, Genzebe Dibaba, only got in as a time qualifier. 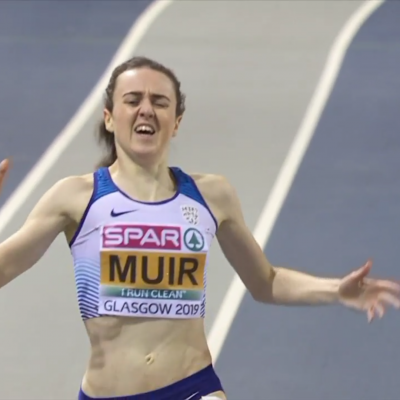 In the first heat, Olympic champ Faith Kipyegon, European record holder Laura Muir and 800 star Caster Semenya all looked fantastic as they went 1-2-3 to advance with ease, but the big story was that Dibaba didn’t look good at all during the final 100, during which she faded to sixth and only advanced as the first of the two time qualifiers thanks to her 4:05.33 time. 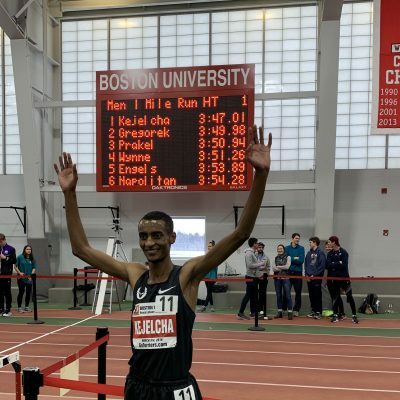 While Dibaba did ultimately advance, the big casualty out of this heat was Ethiopia’s Gudaf Tsegay (#6 seed with at 3:59.55) who didn’t advance after she tried to cut in between 300 and 400 and went down in a fall which doomed her chances. You can watch the fall below. Clearly, it was Tsegay’s fault. The heat didn’t go well for American Kate Grace who was next to last in 4:16.70. In the second heat, 2017 world leader Sifan Hassan got the win and looked great once again as American Jenny Simpson advanced easily in third. After advancing, Simpson pumped her fist and she’d explain later that she did so as she incorrectly thought that Dibaba had been eliminated. In reality, both time qualifiers came from heat #1. However, three runners who have run faster than Simpson on the year did fail to advance out of this heat as #4 seed Winny Chebet of Kenya (3:59.16 this year), #5 seed Konstanze Klosterhalfen of Germany (3:59.30 this year) and #9 seed Besu Sado of Ethiopia (4:00.98 this year) all failed to move on. Klosterhalfen made a huge move mid-race and gapped the field in the middle of this one as she blitzed a 60.9 lap from 700 to 1100 (including a 30.1 200 from 700 to 900) but for the second straight day, she faded badly over the final 100. Tonight, she ran her final 400 in in 65.6 (32.2, 33.4). American Sara Vaughn, who has inspired many by qualifying for Worlds for the first time as a 31-year-old mother of 3, failed to move after finishing 10th. While a number of the top seeds are out and Dibaba looks like she’ll be hard pressed to medal, Simpson, who has medalled at 3 of the last 5 global championships, still faces tough odds in medalling as Hassan, Kipyegon, Muir and Semenya all are looking quite good. Asked about the presence of Semenya — a wildcard with her 50-second 400 speed — in the final, Simpson said that she didn’t think Semenya changes the race but did suggest a faster pace could suit her. Grace said she felt good before tonight’s race, but 1000 meters in her legs were dead and she knew she was in trouble. Grace would fade badly over the final lap and wound up second to last, ahead of only Tsegay (who had fallen earlier). Grace was at a loss to explain why she didn’t have anything left but hopes that she’ll be able to look back on this meet as a learning experience. Grace believes she can become a better 1500 runner but that’s not the only distance she’ll run moving forward. Even though she was in the easier semi on paper, making it to the final was always going to be a tough ask for Vaughn. Coming into the meet, her PR was 4:06.64 and she needed to run 4:05.75 tonight or faster if she wanted to advance. But the 31-year-old has nothing to be ashamed about as she leaves London with a semifinal appearance and a 4:04.56 PR from yesterday’s first round. Tonight, facing the toughest competition of her career, she was just a little overmatched. “I tried to put myself in it, gave it everything I had today, it just wasn’t my best day,” Vaughn said. Vaughn is now headed to Paris and Barcelona for a well-earned family vacation, though she said she’s still looking to squeeze in another race or two before returning home to Boulder. Klosterhalfen said that her goal was to take her heat by surprise by making a big midrace move and she certainly accomplished that by dropping a 60 in the middle of the race. Klosterhalfen admitted that perhaps she should have waited a little longer to make her move but said that she didn’t regret making it. One thing is certain: Klosterhalfen is fearless and a big-time talent to watch in the future. For a 20-year-old to take it to the field in a World Championship semifinal requires crazy amounts of guts and confidence. Props to her for going for it, even if the result was not what she wanted.